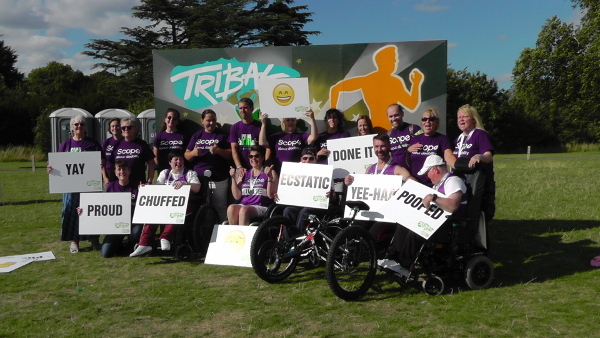 On Sunday 9th August our two teams took their places in the UK’s first ever mass participation ParaTri entering the Sprint Relay and the Half Para Relay in what was to be a fantastic day. 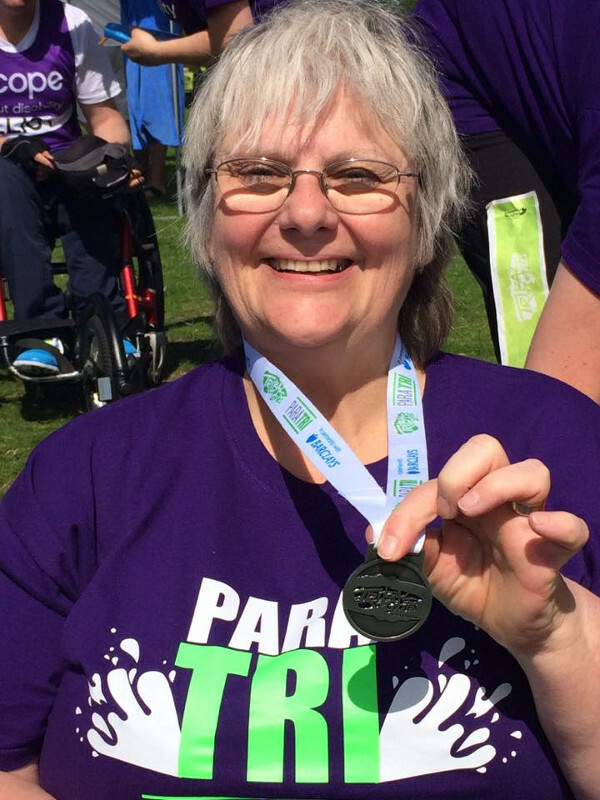 Team one was made up of John, Susie and Chrissie – John and Susie have been attending our Wheel-Fit class for 18 months and Susie also attends our Wheel-Spin class and Chrissie is a Support Worker for Scope. Team two was made up of two more of our Wheel-Fit and Wheel-Spin clients Julie and Elliot along with our class instructor Kris. The day was not only about bringing people of all abilities together but about demonstrating that you don’t have to be a paralympic athlete to take part. Our teams were able to challenge themselves beyond their comfort zone by not only having to work against the clock but also in a different environment. In addition to the team were the support staff involved in not only encouraging and verbally supporting those taking part but some ran side by side to provide guidance and comfort and behind the scenes they ensured everyone was able to attend by arranging transport and attending to individuals needs. In total there were fifteen of us all in our bright purple Team Wheely and Scope shirts which were purchased from money kindly left to the Hereford branch by the late Ray Thomas which brought us all together and created an image of great unity. Everyone taking part raced to the best of their ability resulting in the Sprint team taking 37th place and the Half Para Relay team taking 6th place. Whilst everyone shone there was one team member who’s journey has to be mentioned because not only should it inspire others to keep aiming high but also because a life long dream was achieved. In the Sprint Team was Susie and her contribution to the relay was a 1km wheelchair push which she managed to do in just over 11 minutes. When Susie came to our classes 18 months ago she was unable to open her one hand adequately to push her wheelchair properly and was generally pushed in her chair. As time went on her movements improved and she was able to open her hand enough to grab the push rim and asked to attend Wheel-Spin which wasn’t at that time possible. Instead we agreed she could attend the 10 minute cool down section of Wheel-Spin and we would see how things progressed. Susie couldn’t get enough of it and started arriving earlier and earlier and slowly the abilities in pushing and the use of her hand improved. 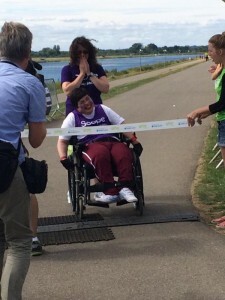 Now 12 months on she actively takes part in Wheel-Spin and has become quite independent and confident which is why she was entered into the Sprint Relay. What is so special about this is that not only did she challenge herself to improve, but as a result she also achieved a long standing ambition on Sunday of being an athlete and all at the of 60. Sunday was yet another proud day for us, seeing the benefits of the work we do and seeing how different lives can be when you believe in yourself and your abilities. We would like to thank the team members for all their efforts on the day an in training and for making it such a special day. We would also like to express our thanks to the staff that not only came along and helped on the day but to everyone involved in ensuring this could happen with cover and arrangements. 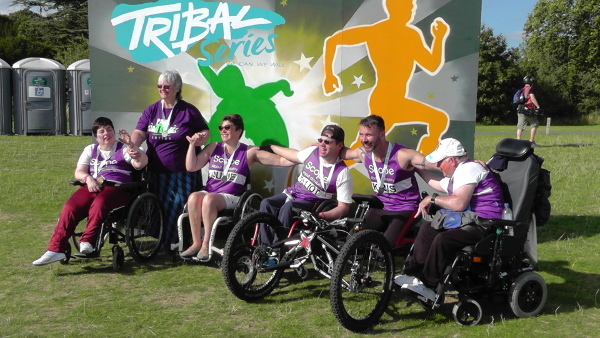 Our thanks also go to the late Ray Thomas and his wife Sheila Thomas who’s generosity and kindness enabled us to look as fantastic as we all felt that day and to ParaTri series for bringing us a great event that will hopefully continue for years to come.